Home>Music> 21 Savage Announces New Release Date For "I Am > I Was"
Everybody expected 21 Savage to release his new album last night, which the artist must have realized. However, he didn't do anything to offset the speculation. As we get into the new releases from XXXTentacion and Gucci Mane, many stayed up to refresh their streaming services, checking for 21 Savage's I Am > I Was, for which the cover artwork was revealed a few hours prior. The December 7 date was previously tweeted by the Atlanta native but he didn't ever confirm it was his album's drop date. In an effort to keep the hype train rolling, he instead chose a day that should actually have been obvious, considering his name is 21 Savage. The rapper took to Instagram to tease a December 21 release date for the effort, writing a short blurb about his time before rap. While it's still not certain that the album will indeed release on the 21st, it only makes sense. 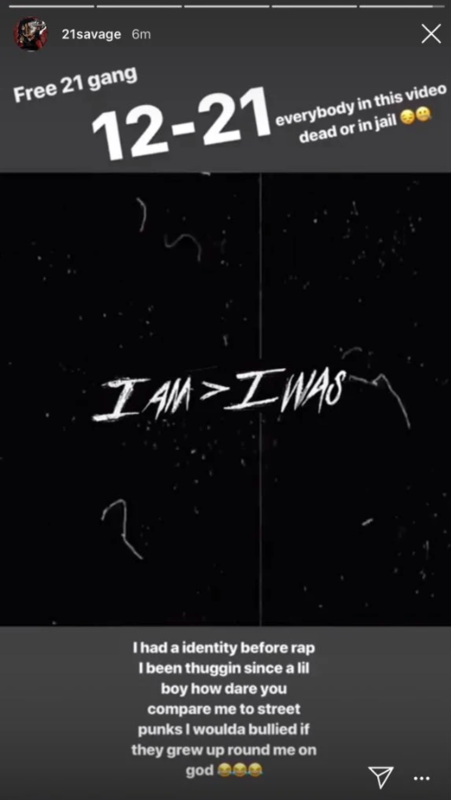 MUSIC 21 Savage Announces New Release Date For "I Am > I Was"